Afghanistan (the Islamic Republic of Afghanistan) is a landlocked country in southern Asia. It shares land borders with Iran, Pakistan, the People's Republic of China, Tajikistan, Turkmenistan, and Uzbekistan. 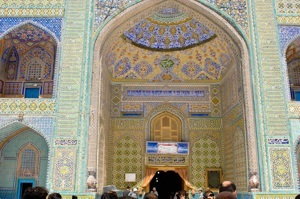 As of 2009. the population of Afghanistan was estimated to be 28,150,000. Approximately 3 million people live in the country's capital, and largest city, Kabul. Kabul is thought to be one of the oldest capital cities in the world, and is believed to have been first established sometime between 2000 BC and 1500 BC. 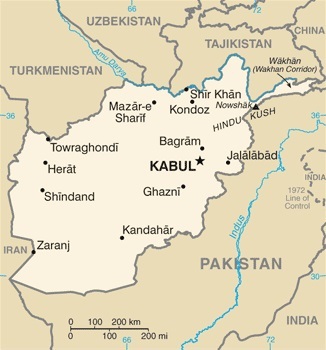 Apart Kabul, Afghanistan contains 13 other cities with populations over 100,000, the largest of which is Kandahar, which has a population of about 450,000. The USSR invaded the country in 1979, and remained there until 1989. During this period, the US backed the Afghanistan resistance movement, known as the Mujahideen. The Soviet backed Communist regime remained in power until 1992, until it was eventually overthrown by the Mujahideen. Civil war then broke out been various Mujahideen factions, this fighting peaking in 1994. The Taliban then began to develop. Eventually they took control of Kabul in 1996, and subsequently most of the country. Following the 9/11 attacks on the United States, in 2001, a coalition led by the US and Britain began bombing the Taliban, and backed the Northern Alliance in the Afghan civil war. This eventually led to the overthrow of the Taliban regime, and the establishment of a new Afghan government. However, Taliban resistance to both the Afghan government and coalition forces continues to this day. Blink as you emerge from the cliffs at the top of one of Bamiyan's enormous Buddha niches. Stop pedalling for a moment and drift in your swan-shaped pedalo on the waters of Band-e Amir. Utter a great smoking sigh of contentment as you puff on a sheesha at Mirwais Shandaiz. Chapters on working and safety in Afghanistan, with advice from resident expats. Specialist contributors write on journalism, women, and trekking in the Wakhan and the Afghan Pamir. Lonely Planet founder Tony Wheeler reflects on travel to Afghanistan over the decades. Stretching from the ancient Chinese capital of Xian across the expanses of Central Asia to Rome, the Silk Road was, for 1,500 years, a vibrant network of arteries that carried the lifeblood of nations across the world. Along a multitude of routes everything was exchanged: exotic goods, art, knowledge, religion, philosophy, disease and war. From the East came silk, precious stones, tea, jade, paper, porcelain, spices and cotton; from the West, horses, weapons, wool and linen, aromatics, entertainers and exotic animals. From its earliest beginnings in the days of Alexander the Great and the Han dynasty, the Silk Road expanded and evolved, reaching its peak during the Tang dynasty and the Byzantine Empire and gradually withering away with the decline of the Mongol Empire. In this beautifully illustrated book, which covers the Central Asian section of the Silk Road - from Lake Issyk-kul through Tashkent, Samarkand, Bukhara, the Kyzyl Kum Desert, Khiva and Merv to Herat, Kabul and Iran - Jonathan Tucker uses travellers' anecdotes and a wealth of literary and historical sources to celebrate the cultural heritage of the countries that lie along the Silk Road and illuminate the lives of those who once travelled through the very heart of the world.